Our onsite photo slideshow made by our friends from 5th Door Productions. Step 3 was crucial in our wedding plans. W@W or Weddings at Work is a website started by Benz and Abet Rana. The w@w yahoo group is composed of (mostly) brides who are planning their wedding. 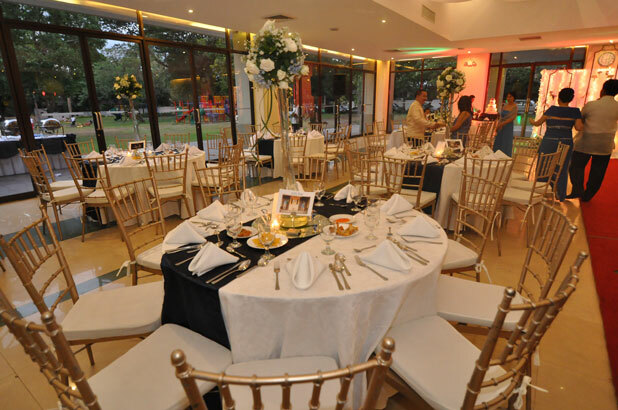 The group is a certified goldmine of information on Filipino weddings—everything from suppliers, to venues, to problems with future in laws are discussed by fellow brides. I first heard about w@w through a former groom of a w@wie bride. I was ranting on how clueless I was about weddings—I wasn’t the type of girl who already had visions on how her wedding was going to be when she was still young. I literally had no idea where to start! He told me how the group had helped him and his wife when they were planning their wedding. Seeing how lost I was, he advised me to join. I have to admit that I was skeptical at first. But a couple of w@w messages later, I was hooked. Until I joined w@w, I didn’t realize how much time and energy went into planning a wedding. 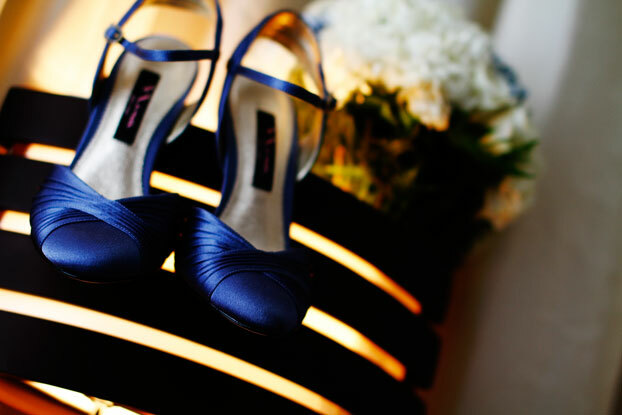 We found a lot of our suppliers through recommendations by fellow brides. The sharing of ideas was nonstop—I was even encouraged to make our own “do-it-yourself” projects. Almost all the little “gimiks” we did for our wedding, we learned in w@w.
The best part about being a w@wie is that I could talk (or write) about our wedding plans all the time! There was no need to censor myself. I got to talk with fellow brides who actually knew and understood the things that we were going through. When a supplier started giving me a hard time, I just posted a rant in w@w and I got a dozen or more messages of support. When we finally booked our venue after months of searching, it was the w@wies who shared our excitement. Thank you to the brides (and grooms) of w@w for the constant feedback and the generosity of ideas. And for the ones who started it all–Benz and Abet–a cyberhug and our eternal gratitude. W@W enabled us to plan and have the wedding of our dreams. We couldn’t have done it without you. I am Hazel and I am proud to be a w@wie. 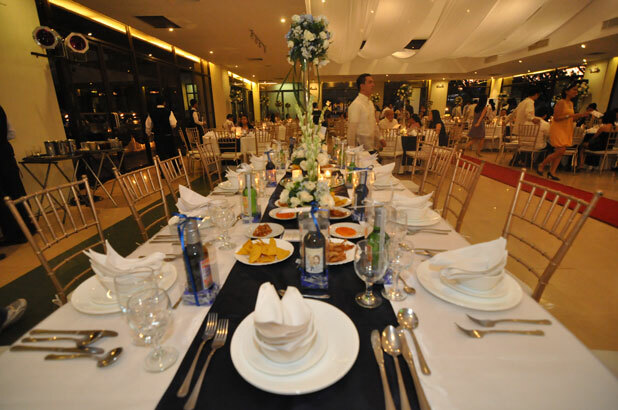 Hizon’s was the first supplier we booked. Mac and I agreed that we can scrimp on everything else but not the food. Although our first food tasting experience with Hizon’s wasn’t that great, they made an effort to make amends—and since my heart was set on getting them from the start, we booked them. There were a lot of negative feedbacks about Hizon that time and most of those feedback stemmed from the quick turnover of their AEs. Madalas na biglaang nagre-resign yung mga AEs nila at hindi maayos yung nagiging turnover ng mga clients. With this in mind, I made it a point that all our transactions with our AE were documented so just in case our AE would suddenly resign, we would be prepared. Our AE did resign but since I was prepared for it, walang impact sa amin. 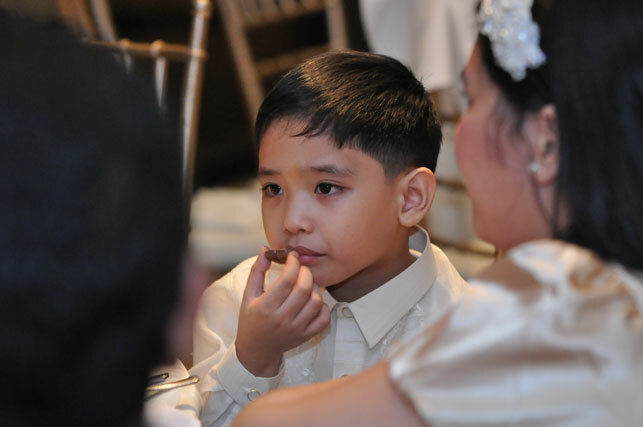 I was turned over to our wedding planner, Drew Menor. I just love, love, LOVE Drew! He’s the best! He’s so easy to talk to—during our detailing, he would make suggestions about the set up and would be brutally frank if he thinks our ideas wouldn’t work. I put my trust in him and on the day of our wedding, NFP was transformed. Ang ganda ng set up nila! My mom was ecstatic—she saw NFP bare and was far from impressed so when she saw what Hizon’s did to the place, napaakap talaga sya kay Drew! 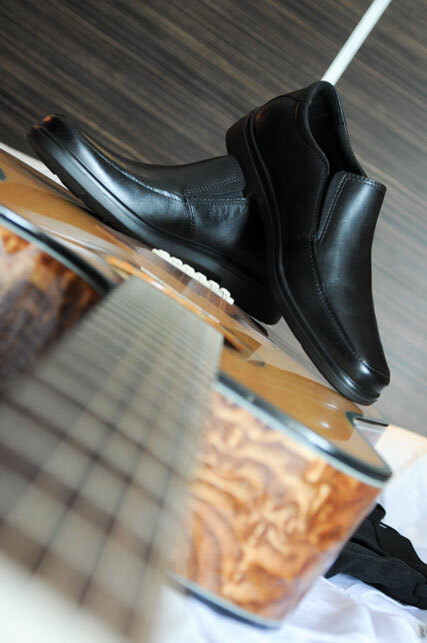 Mac is the type of guy who doesn’t wear leather shoes unless forced to. Good thing he found this pair of very comfy Hush Puppies that we both liked. Thanks to w@w, I learned a lot about making our own DIY projects. I actually enjoyed them! The butterfly baskets were something I thought of as an alternative to bridesmaid’s bouquets. 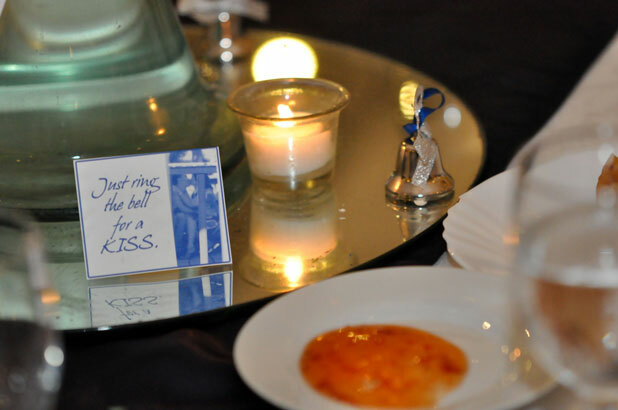 The kissing bells were something I learned from fellow w@wie brides. 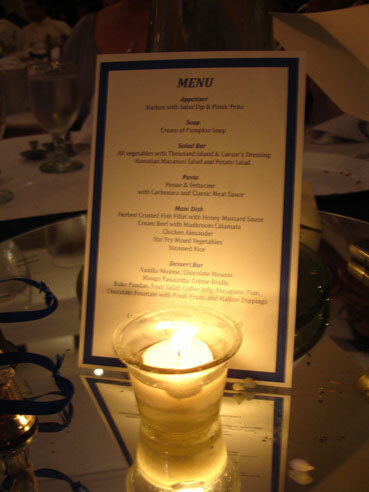 Other DIY projects: Invitation layout, table numbers, the menu. These stuff made our wedding much more personal. I just wish I had more talent in arts and crafts because I certainly would have done more just to cut cost (sobrang kuripot ko talaga! haha!). I found out about Rachebeli through w@w. We were on the look out for gifts for our principal sponsors and the personalized wines seemed interesting. Chelo met with me and my parents for the wine tasting. To be honest, I was a bit skeptical. 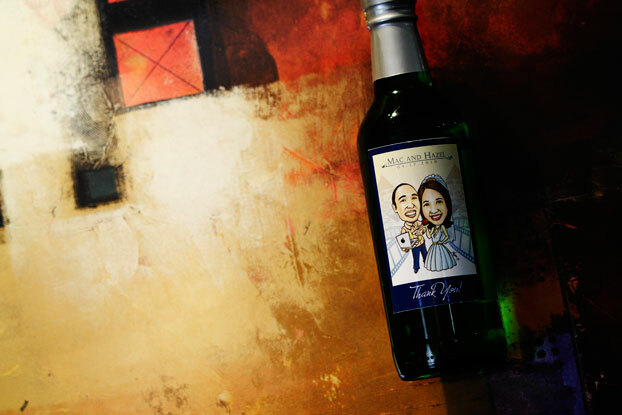 I was a wine drinker myself and I was wary about how “mango wine” or “plum wine” would taste. I shouldn’t have worried because the wines were delicious. My parents loved it so much that they ordered two cases for Christmas. Chelo was also a breeze to talk to. There was a problem with the seals for our wine–the seals they ordered from the US were being held by customs officials so they couldn’t finish my order. I was a bit worried that they wouldn’t be able to deliver the wines on time but they pushed through. Chelo delivered them to our hotel in Makati the night before the wedding. Mac and I wanted to give edible souvenirs for our guests. 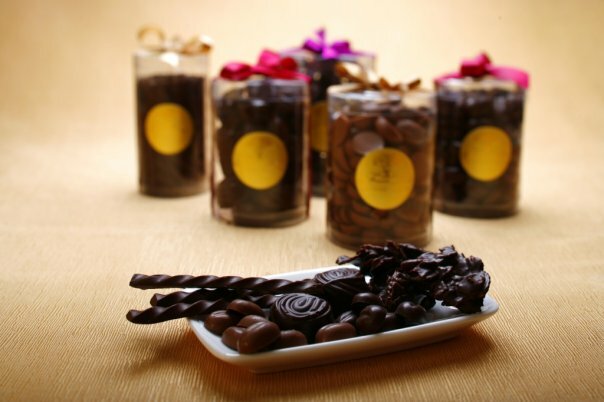 We stumbled on Theobroma’s booth during a bridal fair and decided to give them a try. I’m a chocolate addict and I have to say na sobrang nasarapan ako doon sa sample na pinatikim nila sa akin. Aside from the taste, their packaging was really tasteful and the promo price was a steal. All later transactions were made via text messages with Lucy. They delivered the chocolates to Mac’s house two days before the wedding. We were afraid that the chocolates would melt because of the heat but we were just instructed to keep them out of direct sunlight and not to put them in the refrigerator. 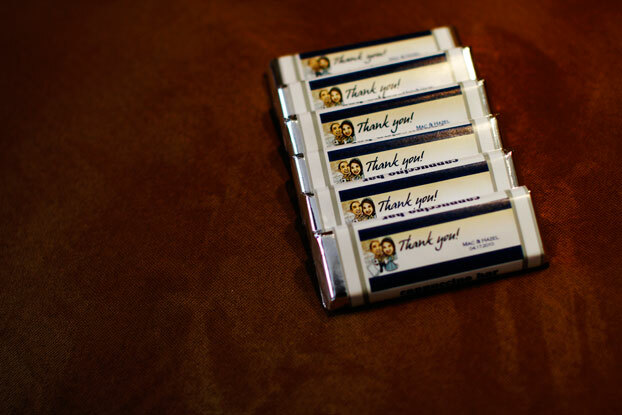 Our guests loved the chocolates! Yung iba nga daw hindi na umabot sa bahay at kinain na nila during the reception. Highly recommended for couples who want to give away edible souvenirs. Hassle free and delicious! My best friend (who’s also my MOH) and her twin sister shouldered the cost of the photobooth as their wedding gift for us. Since they’re based in Singapore, they just asked us to canvas and book for a photobooth supplier. Vida is a friend of a friend. We compared the quality of her photobooth’s prints to other suppliers and figured that hers is the best at the price she was offering. With the free STD magnets, it was quite a steal. The photobooth was a hit with our friends. Yung iba paulit-ulit talaga nagpakuha ng pictures. Sayang lang because some of our relatives from the provinces didn’t understand what it was for. Parang kahit sinasabi na nung emcee and nung coordinator namin na may photobooth, parang nahihiya yung iba. It was a good thing that we had another set of souvenirs to give away. Super bait din ng mga taga-Shutterbox. They were actually packing up na when one of our guests asked if they can set up again so they can take a picture with us (kasi naman sa kakaikot namin ni Mac sa mga guests halos di rin kami nakapagpakuha sa photobooth). They set up their equipment again without complaint and gamely took more pictures. Ang tagal pa naming nagkipagkwentuhan sa kanila while waiting for them to burn the pictures in a cd. For those who also got a photobooth, better ask a relative or a friend to explain to your guests what it’s for. Overall rating: 5. Highly recommended for the quality of prints and great customer service. From the start, I wanted a former w@wie to be our coordinator. I admit, may bias ako kasi naman, iba talaga mag-plan ng wedding ang mga w@wies. J I met with several former w@wies turned coordinators but among them, si Manel ang pinaka-kasundo ko. It also happened that during that time, she was offering a great promo discount for w@wies. Manel was always early for our meetings. She never failed to remind me of my appointments or to follow up on my progress. She was also very helpful with her suggestions and whenever I get stressed over the planning, she always calms me down. On the day of my wedding, when I realized that Reggie was not going to show na talaga, I placed a frantic call to Manel. She was on her way to the hotel that time but I asked her to find me a fitting form (kailangan talaga mailagay sa fitting form yung gown ko para ma-plantsa yung train). She told me not to worry and that she’ll take care of it. Late na sya nakarating sa hotel but she was able to find a fitting form. It was a good thing that our meetings were extensive so I didn’t really need to turn over anything to her when she arrived. Humiram agad sya ng iron from the hotel, ordered food, organized the stuff that they needed to bring to the church and reception. My mom was all praises for her—she kept saying that Manel was like a superwoman. 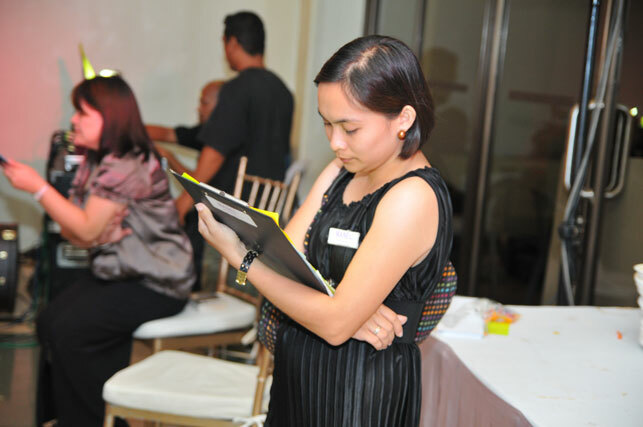 During the reception, she calmly took care of everything. All our instructions were followed to the letter. After the event, she turned over all our stuff to my mom and the money I gave her was properly liquidated to the last centavo. She and her team were like angels that day. My family and I are extremely thankful for the service they gave us on our wedding day. I honestly don’t know what would have happened to our wedding if not for her. Overall rating: 5+++++++++++ Super duper highly recommended! Mac was the one in charge for this particular supplier. He used to moonlight as an audio guy when he was younger so he knew a lot about sound equipment. Whenever I suggested a supplier to him, he would ask for their list of equipment and he always had something to say. Kesyo “masyadong mahal e pambahay lang naman yung equipment” or “bakit ganyan kadaming tao ipapadala nila? Hindi naman kailangan…” etcetera… finally, I gave up and told him to look for a lights and sounds supplier himself. JR Music was suggested to him by a friend of his. According to Mac, the original package price was 15k but he haggled, crossed out several equipment that he felt we didn’t need until the price went down to 8k. As for the audio, we didn’t notice anything wrong during the wedding but my friends told me na namatay daw yung isang microphone nung isang singer nung band namin. Mac and I didn’t notice it because we were seated close to the band. Naayos din naman daw yung technical problem pero sayang lang daw kasi namatay pa yung mic during a duet. Overall rating: 4. Technical problems are inevitable during an event. It’s the response to the problem that counts. Highly recommended supplier. Mac and I used to be employed by this production house. This was where we met and some of our closest friends are still with this company. 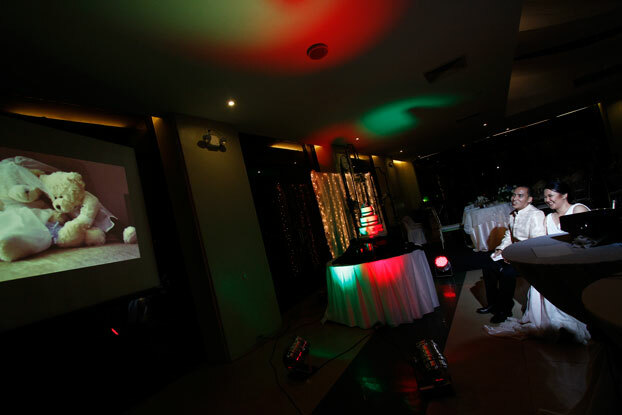 As a wedding gift, the owner offered the use of one of their LCD projectors. Ang nakakatawa, nagkataon na may kasabay kaming event on the day of the wedding. Yung pinagamit nilang LCD sa amin, mas maganda kesa doon sa event nila. That’s how important we were to them. Sobrang linaw nung projector na kahit hindi patayin ang ilaw, kitang-kita pa rin yung video on screen. Medyo na-late nga lang sila ng set up so my coordinator had to re-shuffle the program but no worries. I didn’t want my flower girl to carry flowers (as I mentioned earlier, I really felt that spending too much on flowers was a waste). I got the teddy bears idea from a fellow w@wie. My best friend, who’s based in Singapore, knew how to sew and I asked her if she can help me make the dress for the flower girl’s teddy bear. She agreed. 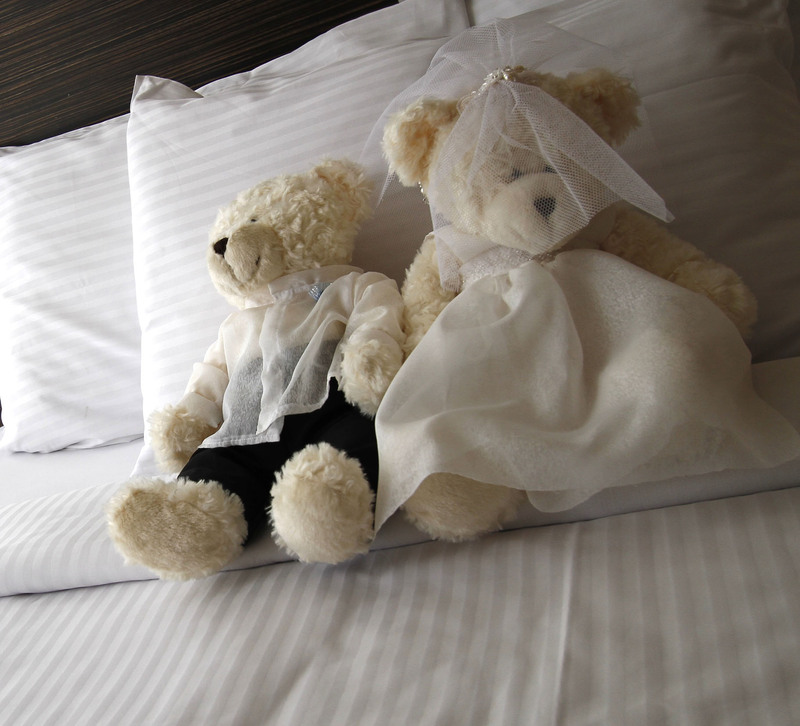 Nagulat ako when I found out that instead of just one, she made two bears—a bride and groom. When I saw them, napatalon ako sa tuwa. Sobrang cute! Siendy made the bear’s bridal gown while Tita Dulce (my best friend’s mom), made the barong and pants and added beadwork to the teddy bear bride’s gown. Nilagyan pa nila ng veil and earrings! 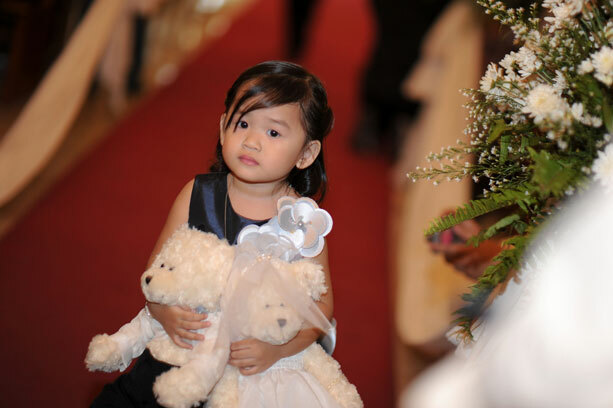 Our flower girl looked so adorable during the march while she carried the bears. Love it!